Soon on show at L’Oeil en Seyne, Seyne-sur-Mer, France. 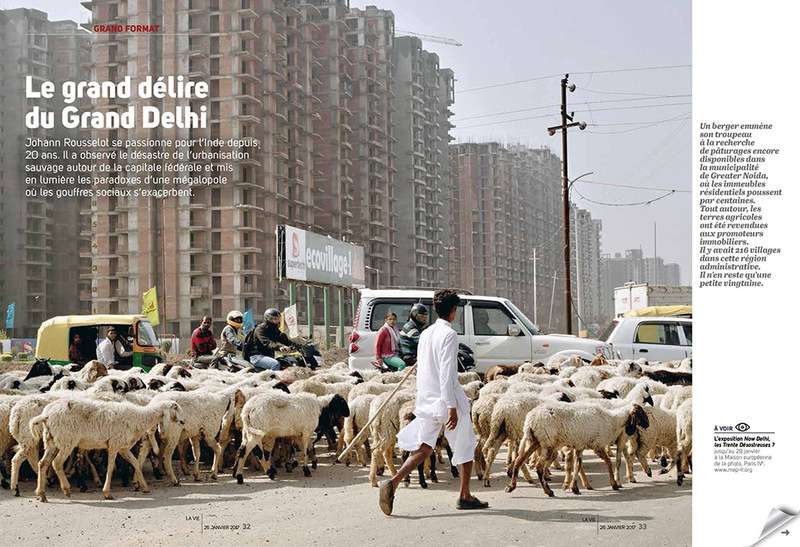 Centuries ago, Delhi was the most populated city in the world. For better or worse, there’s every indication that the current conurbation, Delhi NCR (National Capital Region), is going the same way. Its many satellite towns and rapid urban expansion, accelerated by the law of the car, have turned dull Delhi, the straight-laced sister of exuberant Bombay, into a megalopolis without it even noticing. The authorities have tried hard to keep up with reality, in a constant effort, since the Partition (the creation of Pakistan), to control the waves of migration and their urbanistic consequences. The dreams of edification harboured by post-colonial society, along with those of modernist architects, were somewhat thwarted by the humanitarian emergency of the 50s and economic centralisation based on Nehruvian socialist ideals finished the job in terms of urban planning. Then, in 1996, a Plan was set up to halt the movement of urban proliferation typical of third world countries in the 80s, the key features of which were massive development of the grey economy and usurpation of public space. Given the monumental changes resulting from the economic opening up of the country in 1991, the authorities are now trying to apply the “Delhi 21″ plan (deadline: 2021). Brutally contemporary, Delhi is a jungle everyone is trying to escape and protect themselves from on a daily basis; otherwise this city eats you up. Delhi NCR is a perfect illustration of this paradox: if you make a city better, more people will come and live there; and if more people come, it will start to get worse. The challenges are immense: access to drinking water, public transport networks, energy, pollution, sustainability… Grand Delhi is an archetypal urban territory of the 21st century, led by the forces of globalisation, and the incubator of a very uncertain urban future; an urban Frankenstein. Traductions réalisées grâce au mécénat de l’agence Wally Thomas-Hermès with style. Exhibition at Maison Européenne de la Photographie, Paris, november 09th, 2016 to january 29th, 2017. Exhibition at photo festival L’Oeil Urbain, Corbeil-Essones, march 31st to may 21st 2017. La Chronique d’Amnesty International | November 2016.